The benefits and anticipated opportunities for SDR technology are having a significant impact on the wireless industry’s value chain. This chain consists of product-based and service-based providers, with value added at each stage, ultimately resulting in SDR end products and services that meet the needs of the end users and subscribers. Throughout the chain, the providers may be supported by external organizations such as educational institutions, research laboratories, industry standards bodies, investors, tests & verification and government. These supporting organizations provide critical input as development progresses through the chain, ultimately reaching the end user. The detail of the chain and the relationship within the context of the Wireless Innovation Forum membership is outlined below. Please note: companies may represent more than one category in the value chain. For instance, some defense contractors develop their own SDR subsystems and application software. Equally most component providers also provide development tools. Click here or on the image to go to the SDR Products and Services Directory to see information about Wireless Innovation Forum Members within these Value Chain areas. 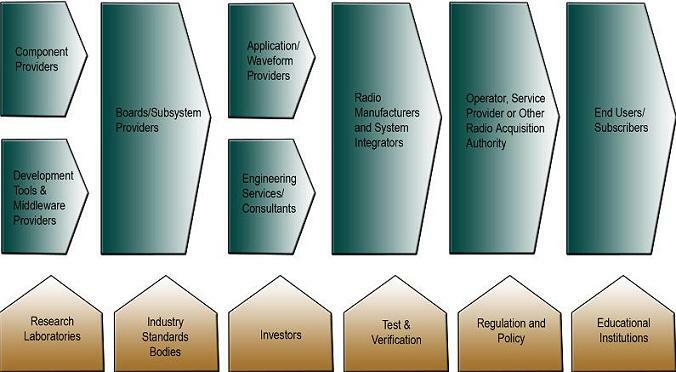 SDR has far reaching implications within the chain impacting a variety of organizations and industry sectors through the radio frequency (RF) chain (front end components, software developers, chips makers, etc) and throughout business modes (service providers, OEMs, IP holders, etc.). In order to provide viable products and services to meet the future development potential of SDR technology, organizations must look to structure SDR into all levels of the value chain. With successful applications seen in a number of markets, the opportunity to fully engage SDR at all levels of the chain is now.